There are three things that separate man from the beasts in my view: the gift of speech, opposable thumbs and dressing for dinner. Sadly there are fewer and fewer opportunities for men to dress up and which require of them any effort. I realise I’m preaching to the converted here, but just why so many men have willingly un-evolved to the point where even T-shirt and jeans are common place attire for dining out, a night at the theatre or lounging in a cocktail bar is beyond me. Of course those of us who do care about our appearances and make an effort can often find ourselves out on a limb. So an event for which dressing up and making an effort are a quintessential part of the experience was always going to interest me. 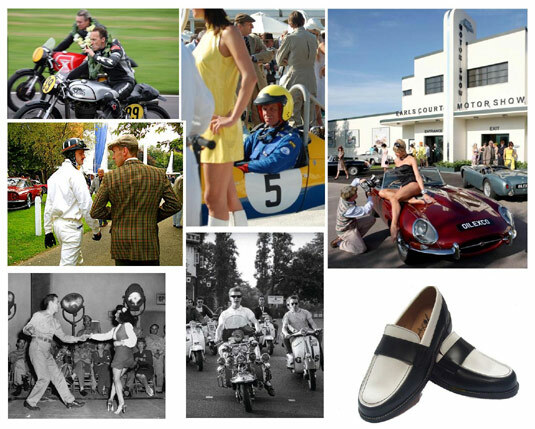 Vintage Goodwood is a collaboration between Lord March, of Goodwood Revival and Festival of Speed fame, and Wayne and Gerardine Hemingway, which will bring together an extraordinary mix of fashion, music, film and design from the 1940s to 1980s. A three day event set on the Goodwood estate located in the beautiful Sussex countryside, it aims to be a show case for 5 decades of British cultural creativity, with an emphasis on living the periods not merely experiencing them. To that end there will be bars, clubs, restaurants and even a vintage high street upon which you can enjoy experiences such coffee in a 50s coffee shop or having your hair done in a 60s salon. Iconic British band the Faces will be re-forming to make a live appearance. I discovered all this during a chance meeting with Nicholas Butterworth who is part of the team staging and publicising the event. This may all sound rather eccentric, and it is – which is itself a quintessential feature of the British cultural identity. Having been to the Goodwood Revival, which for those who don’t know is the largest historic motor racing meeting in the World, part of the magic is the effort people make to dress according to the period, from drivers to spectators and staff. Now, to some this may seem rather silly, but events such as the Goodwood Revival and Vintage Goodwood are a rare opportunity to celebrate manliness in an age when glamour wasn’t merely a hassle. Here here…Goodwood vintage is a sadly decreasing opportunity to buy some great vintage pieces and to celebrate quintessentially English style. We’re showing at Goodwood Revival for the first time this September. We hope that it will prove to be a great way to meet new bespoke customers; individuals with a strong personal style. I haven’t been to the rival for a number of years, a return trip is certainly in the offing. I can see your shoes going down a storm.